Storm events, waves, human activity, and natural channel migration can lead to erosion that threatens private property and infrastructure along rivers, lakes, and streams. A properly designed and installed bank stabilization and/or restoration project will ensure stability and avoid causing issues for adjacent landowners. 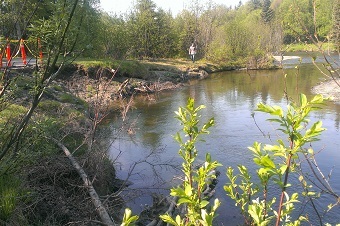 A riparian buffer is beneficial to fish and wildlife populations and provides a stable vegetated streambank or lakeshore. 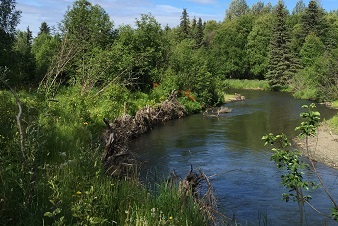 The use of vegetation in restoration or stabilization projects can protect land from erosion while providing important food, shelter, and shade for fish and other aquatic species. Riparian vegetation can also reduce flooding potential by storing water and filter storm water runoff, keeping pollutants and sediment out of our rivers, lakes, and streams. The ADF&G has developed a guide for Streambank Revegetation and Protection that contains information on revegetation and restoration techniques, plant species selection, and additional resources for fish-friendly bank stabilization. Contact your local Division of Habitat office to obtain a copy of the guide or for help determining what technique may be appropriate for your project site.